We know that trying to find that perfect present for your husband/wife/boyfriend/ girlfriend/partner/significant other can be difficult at times. Keeping it special, year after year for birthdays, Christmas, or an Anniversary is not easy. That’s where we come in. 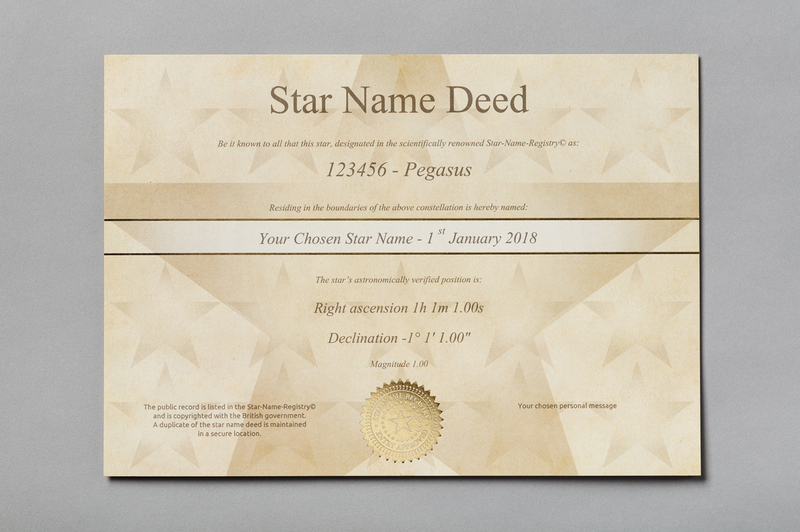 Star Name Registry helps you mark your love for a person within space of eternity itself. If you’re still not convinced, here’s 10 reasons why dedicating a star for that special someone in your life is guaranteed to make the perfect gift! 10) You can be confident your partner's star won’t be named twice! Yup. As part of our commitment to providing the most reliable and interactive international star register service not a single Star on our Registry will ever be named twice! This makes sure that your Name A Star gift is unique and absolutely tailored to you and your partner. 9) It comes with a TON of information that will educate you about the universe! Regardless of which package you order, every package comes with some essential STAR FACTS on a5 sized leaflets. So, both you and your partner can learn more about the stars and the Universe! And if you order a Binary Star or an Extra Bright star it comes with a bonus leaflet that explains what makes these celestial bodies different from the standard star in the sky! 8) They would never expect it! Yup, most people are not aware that you can Name A Star in the sky! So imagine the surprise and joy on their face when they see they have forever left a mark in the International Star Register. But, the Star Naming experience doesn’t end when you receive the gift. You’re able to track your Star on our fully interactive Star Register! We’ve also made it super easy too to share this on Social Media too! Just click the share button and it will generate an image of your star's location for everyone to see! The Name a Star gift is really one that keeps on giving. If you have the certificate hung up in your wall, or framed up on a mantlepiece, any visitor will be curious as to what it is. If you’re planning to have some friends over any time soon we guarantee it will make for perfect after dinner conversation! The Name a Star gift is really one that keeps on giving. If you have the certificate hung up on your wall, or framed up on a mantlepiece, any visitor will be curious as to what it is. If you’re planning a dinner party any time soon, we guarantee it will make for the perfect conversation starter. Yup, any name will be accepted! If your partner has a pet they lost long ago, or a favourite fictional character it will be allowed into the registry. It’s just an extra little touch to ensure that your Name A Star gift will be that extra special. 4) Know your partners Star Sign? Your can name your Star within a constellation! Another way we help you personalise your Name A Star gift is through our constellation service! Basically, every star in the sky lies within the area occupied by one of the constellations! This includes every star in the Western Zodiac from Aquarius to Capricorn. If you're keen on learning some of the histories of the contelations, check out our previous blog posts for information that will dazzle your partner! Need that extra special gift on a budget? Our Basic Packages will suit your purposes perfectly! But if you have a little more cash to spend, check out Our Luxury Gift-sets! These are perfect if you want to give your Name A Star gift that extra WOW factor! Regardless of which package you choose, every star comes with this amazing certificate. Printed with the highest quality ink and on the highest quality paper, it will illuminate your room with its unforgettable twinkle. But when it is all said and done, when you finally settle on your star name, what package you want, which constellation it falls under; the star will last. While we do offer a service, which will rename your star if it goes supernova, so far, we have never had to do so. All stars do go out eventually, but because they last for so long it’s likely that your great, great, great, great, great, great, great grandchildren will still be able to find that star you named over 8 generations ago. There is no better way to establish a long and memorable legacy of the love that you and your partner share. Everything you need to get started with our Name A Star products can be found on our website store. And as stated in the post above, you can even name a star that lies within a constellation of your choice!